Gurdjieff taught that an individual, alone, is able to do nothing. Therefore group meetings are offered where students regularly come together to participate in a collective atmosphere that is meant to function as a principal means for the transformation of the individual state of consciousness. Such group meetings allow for an exchange of questions that emerge from one’s personal efforts, that are shared with peers and those more experienced. What is important and encouraged in these meetings, is the individual work of facing oneself and consciously recognising one’s own inner lack in the context of ordinary life. 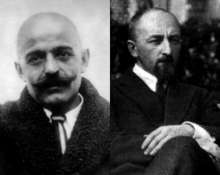 The “Sacred dances and Movements” that Gurdjieff taught are unique and based to a large extent on his research whilst in the monasteries and schools of Asia, Europe and the Middle East. The postures and gestures of the Gurdjieff Movements are a very precise language that when supported by an intentional use of melody and rhythm along with right individual effort, can help to evoke an inner condition that is closer to a more conscious way of being, or a state of unity which can enable an opening to the conscious energy of the Self. This is a music that stands apart from what Gurdjieff referred to as the “bon ton” of popular music, which he maintained is purely subjective and so works to deaden rather than awaken the sense of search and conscience in man. Gurdjieff had a deep understanding of the dynamics of energy and the way energy vibrates in different mediums. He considered the human body as an instrument composed of various densities of matter that vibrate in different ways under different influences. He understood that the same force would act differently on the various faculties that make up the human organisation and that in order to truly fulfil its function, the body required a special kind of tuning to bring all aspects together and to resonate in harmony. Gurdjieff’s music is such a force. This unique gift is able to still the mind and remind us of what it means to be whole. Gurdjieff composed music for various reasons – performance and quiet listening, as a support for his dances and movements and as a means of study. The practice of Sitting is not a “form” in and of it self, but is a preparation for the inner search within the midst of life. The basic aim of this “quiet” work is to help cultivate an attention that allows and sustains a relationship with all the forces constantly moving within the body. In our ordinary life, we lack the 'will' to sustain the necessary attention for self study, as the power of the forces and our conditioning continuously distract us from our aim. But in working with others under the special conditions of a work day, engaged in practical tasks, while attempting to sustain an inner demand, provides a constant reminder to return - to remember. The special conditions of a work day, halfway between the intimacy of a group meeting and the dispersion of everyday life, offers the possibility of seeing oneself in a new way and accumulate that special quality of attention required for a taste of a new way of being. The struggle to be “present” in everyday life constitutes a major aspect of Gurdjieff’s teaching, a struggle that leads to a full engagement in the duties and rewards of human life in the present. In this context, Gurdjieff created conditions to help his pupils experience the fundamental practice of self-observation and divided attention. Through such experience, a man or woman can begin to come into contact with an ever-deepening sense of inner need – a wish, that allows an opening to a powerful conscious influence within oneself. According to Gurdjieff, without a relationship with this more central aspect of oneself, everyday life is bound to be an existential prison, in which the individual is held captive, not so much by the so-called forces of modernity, as by the parts of the self that cannot help but react automatically to the influences of the world. The help offered by the special conditions of the work is therefore understood not as replacing our life in the world, but as enabling us, in the course of time, to live life with authentic understanding and full participation.